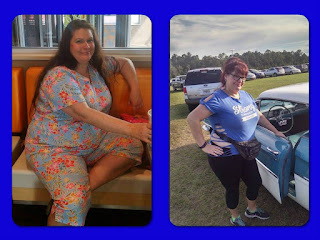 Jennifer Wood Fitness : Marcie's Fitness and Health Transformation ~ From a Diabetic struggling to walk across her home to a FIGHTER who is working out and getting results. Marcie's Fitness and Health Transformation ~ From a Diabetic struggling to walk across her home to a FIGHTER who is working out and getting results. "16 months ago, I was at my whits end. This disease called type 2 diabetes had me laid up on the couch and in the bed sleeping for hours on end. I couldn't even walk across the house without being out of breath. How was I to go to the mailbox? Grocery shopping for my family was horrid and doing the household chores forget it. I felt helpless and hopeless. This made it worse and I would just stuff my feelings with more food. Which in turn, you guessed it made it worse still. My a1c [blood sugar level] was a 9.8 I was on two different diabetic medicines twice a day and on 36 units of insulin. I was well on my way to getting it increased. I had a 5 inch notebook full of diets and I had tried them all. I tried everything!!!! Nothing worked. Then I was invited for the 20th time to join a group of wonderful women who actually cared about my health and well being. I finally decided to sign up. But I was thinking to myself this isn't going to work. Nothing else did. But there is a light at the end of the tunnel. They did do what they said they would do. They did care about me and my health. They gave me advice and guided me, and most of all, they held me accountable. With in 3 months my a1c was a 6.8. My doctor said that he never had anybody to do that before. And the program and shake that I was doing he knew all about it and said that it was a true miracle. Fast forward to now I am still working on me and I am off insulin and one of the diabetic pills. I am so close to my goal of being total diabetic pills free, and I decided to be a coach too because helping people matter to me. You too can get these kind of results. Oh by the way..... Are you still wondering if I can walk across my house now? See my videos [on her Facebook page] and tell me if you think I can...."
You heard it! This system is FOR REAL. It works. It's legit. It transformed Marcie's life. We are a Team that truly cares. Not just someone who sells a Beachbody product and disappears. If you are ready to make a change and need the tools and support to do it, message me and let's talk. Are we friends on Facebook? If not, send me a friend request.